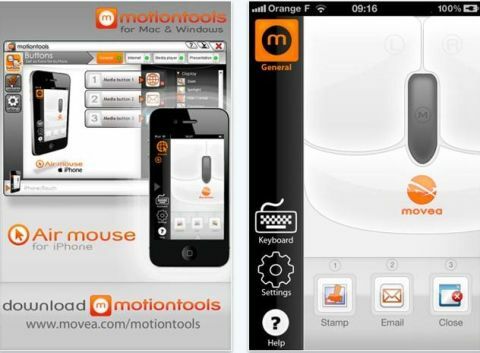 The leading provider of motion processing solution, Movea has debuted its Air Mouse application for hot-selling iPhone 4, which allows users to turn the iPhone 4 into a powerful in-air motion controller for PC-connected home media and business presentation uses. Movie Air Mouse app takes advantage of iPhone 4’s built-in gyroscope sensor and Wi-Fi connectivity (range of more than 100 feet) to complement the Movea’s MotionSense technology. Movea’s MotionTools software for Mac and Windows PC is working with the Air Mouse app, providing users unparalleled set of tools and effects that enable them to customize, activate and control desktop applications with a flick of the wrist. “We are excited to enable iPhone 4 users to transform their phones into a powerful, motion-sensing peripheral to create poetry in motion for more effective communications and more immersive entertainment experiences,” commented Bryan Hoadley, Executive Vice President for worldwide sales and GM at Movea, Inc.
Movea Air Mouse app for iPhone 4 is now available for download on the App Store with a price tag of $1.99.